It’s been awhile since I’ve written about my whereabouts in “Where’s Julie,” but it was a date night to remember that I wanted to share with you. As a Rolling Stones fan who has seen the world’s greatest rock and roll bank in concert over 40 times, I was super-excited to have great seats for the kick-off of their “50 and Counting” anniversary world tour, which started in Los Angeles. On Friday night at the Staples Center, even with the controversy of the overpriced tickets, I was treated to two hours and twenty minutes of solid rock and roll and another memory that will remain in my heart and soul forever. As a former music radio DJ, I’ve had the unique experience of meeting the band, seeing them perform for four decades spanning three countries, I couldn’t miss this historical event, even as I wondered if it would be my last time. Speculation was abuzz all week long as to who the surprise guests would be. After all, this is Los Angeles. If Bruce Springsteen and Lady Gaga showed up in New York, someone could easily hop on stage from the audience to add to the harmonies on a tune or two. Urban sang to the song “Respectable” from their Some Girls album. The snippet of the video clip from his performance was posted to his twitter page and can be found here. The show started an hour late, possibly due to the late arrival of Jack Nicholson, a regular at the venue during the Lakers Games. Nicholson received a standing ovation as he made his way to the front of the stage area. Shortly there after, the UCLA Bruins Marching Band arrived for an introduction to “Satisfaction.” Then one of the greatest shows began. “It’s either us or the Lakers, so now you’ve got us.? It doesn’t matter to Jack Nicholson because he was coming to both of them.” (Jagger’s apology for the date change). 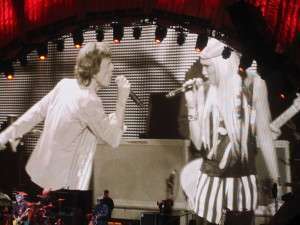 Jagger ran around the stage like a Mexican jumping bean causing anyone in their 60s and 70s to feel a bit jealous of his energy. 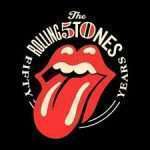 This weekend The Rolling Stones performed their first U.S. concert in their “50 and Counting” Anniversary Tour in New York. For those who couldn’t attend the show, we’re featuring their hit song, “Emotional Rescue” as our selected Cyber Love Song of the Week. Who wouldn’t want to be rescued by a Knight in Shining Armour? Serious blues fans and jazz-subscriber enthusiasts at the Hollywood Bowl enjoyed a night of Rock n’ Blues from James Cotton, Dr. John, and Buddy Guy on August 12, 2009. Collectively they span over 150 years of music including a nice collection of Grammy awards.? The evening started out with James Cotton smiling in his chair enjoying the evening with his signature harmonica. Cotton played ?his famous Got my Mojo Workin’ a tune he’d recorded and performed with Muddy Waters. In the second set, we were treated to Dr. John and the Lower 911. The New Orleans voodoo singer/piano player performed his hit, Right Place, Wrong Time, from a time where he was better-known as Dr. John the Night Tripper. His signature “skull” was displayed on a table during the performance, making one wonder, just how much witchcraft has he experienced in his lifetime? The highlight of course was Buddy Guy, the headliner of the evening. Buddy Guy, a Rock and Roll Hall of Fame inductee, made an appearance in Martin Scorcese’s documentary about the Rolling Stones, Shine a Light, and has won 5 Grammys. I remembered the night I saw him open up for the Rolling Stones. I was lucky then and felt just as fortunate last evening. The crowd loved Hootchie Coochie Man and my favorite tune of the evening was his tribute to Eric Clapton and Cream where he performed his rendition of?Strange Brew. Considering the fact that I missed the Eric Clapton & Steve Winwood show earlier this summer at the Hollywood Bowl, this wasn’t a bad substitute. He also played the title song from his latest CD,?Skin Deep . Even if you weren’t a blues fan, the show appealed to all ages who were happy to experience a night of legendary musicians who still performed at their peak. Julie Spira is the author of The Perils of Cyber-Dating: Confessions of a Hopeful Romantic Looking for Love Online. Visit her at www.CyberDatingExpert.com.